It's day 22 of my blog marathon and today I wanna share my quick diy face mask for glowing skin with you all, which you can easily make at home. 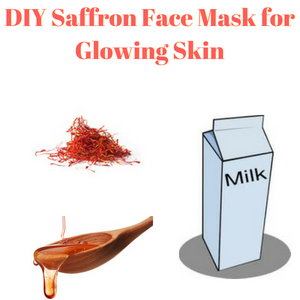 You can use this diy face mask to give yourself the perfect glowing skin and to provide your skin the nourishment that it requires. Mix warm milk, saffron strands and honey together in bowl and leave it for few minutes. Then apply this mask on your face and leave it on for 25 minutes and wash it off with plain water. After that you can apply either toner or moisturizer of your choice. Lactic acid in milk will help reduce pigmentation, heal dry skin, hydrate skin, heal acne and relieve sunburn. Saffron contains many vitamins and antioxidants that are beneficial to the skin. It is anti-inflammatory and soothes skin. It is anti-fungal and can be used to treat acne. It will also help lighten your skin (it is also used as an ingredient in many beauty products). Honey is naturally antibacterial, so it's great for acne treatment and prevention. It's full of antioxidants, it is great for slowing down aging. It is extremely moisturizing and soothing, so it helps create a glow. In nutshell, this diy face mask will brighten and whiten your skin and will make your skin glow naturally by reducing any spots/marks/acne scars on your skin. Use it regularly to make your skin more beautiful! I hope you all are enjoying my face mask recipes, and I hope my DIY's help make your skin even more beautiful!